5126 Diospyros kaki - Persimmon var. Fuyu, Low chill, Grafted, 3 gal pot ? Oriental persimmon: looks like tomato, 3" diameter, skin - deep orange, flesh - light orange, very few seeds. Non-astringent, eaten crisp like an apple or soft. Self fertile, orange with light orange flesh. Medium sweet taste. Pest free, hardy attractive, firm, non-astringent. Most popular non-astringent variety in US and Japan. Non-astringent cultivars have lost their astringency by maturity and can be eaten crisp like an apple or at various stages of softness. 3736 Diospyros kaki - Persimmon var. Fuyu, Low chill, Grafted, Large size ? 2525 Diospyros kaki - Persimmon var. Jiro, Low chill, Grafted ? 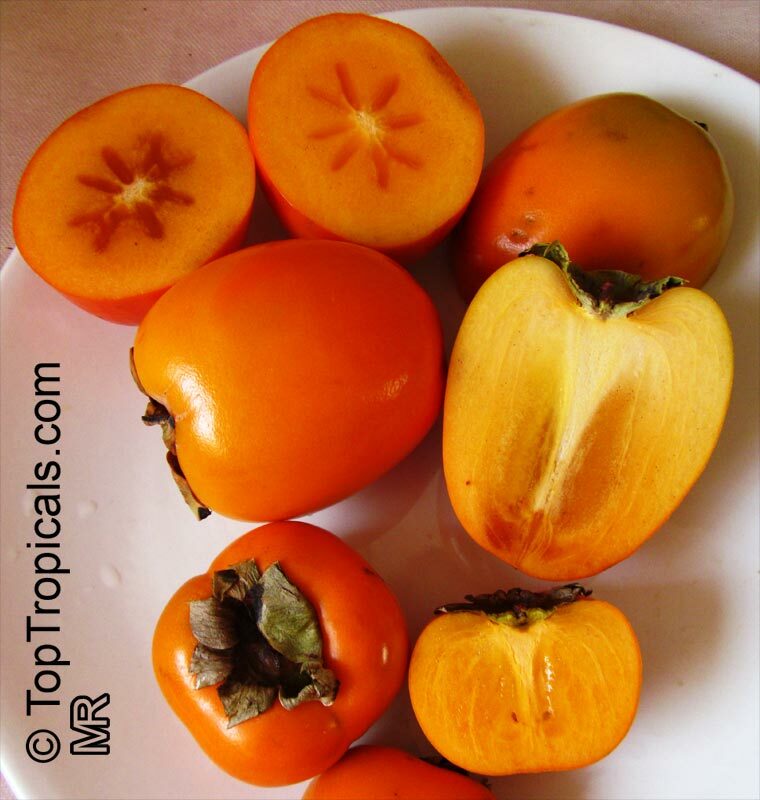 Kaki, Japanese Persimmon, Oriental Persimmon. Non-astrigent, sweet crunchy fruit! 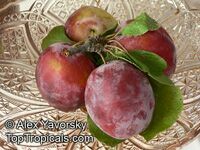 A popular dooryard fruit and a handsome ornamental with drooping leaves and branches that give it a languid, rather tropical appearance. Under mild autumn conditions the leaves often turn dramatic shades of yellow, orange and red. Tea can also be made from fresh or dried leaves. 4100 Diospyros kaki - Persimmon var. Saijo, Low chill, Grafted ? 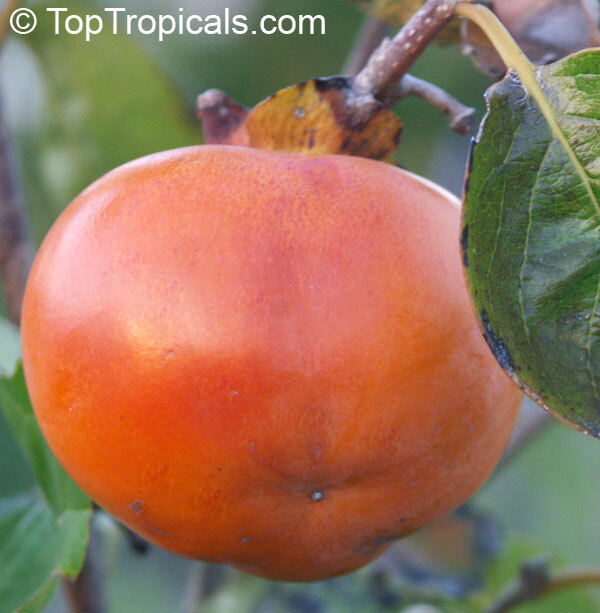 Oriental persimmon: Saijo, which means "the very best one" in Japanese. Very cold hardy cultivar. Small yellow elongated fruit. Sweet excellent flavor, ranked among the best by gourmets. Medium height tree. Bears consistently. 4722 Diospyros kaki - Persimmon var. South Florida, Low chill, Grafted ? Persimmon var. South Florida - doesn't need chill hours to produce lots of fruit! Kaki, Japanese Persimmon, Oriental Persimmon. 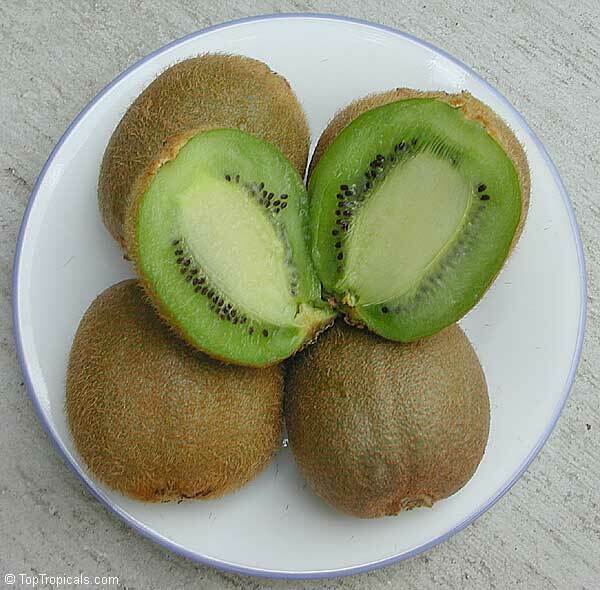 Non-astrigent, sweet crunchy fruit. 3737 Diospyros kaki - Persimmon var. Tanenashi, Low chill, Grafted ? 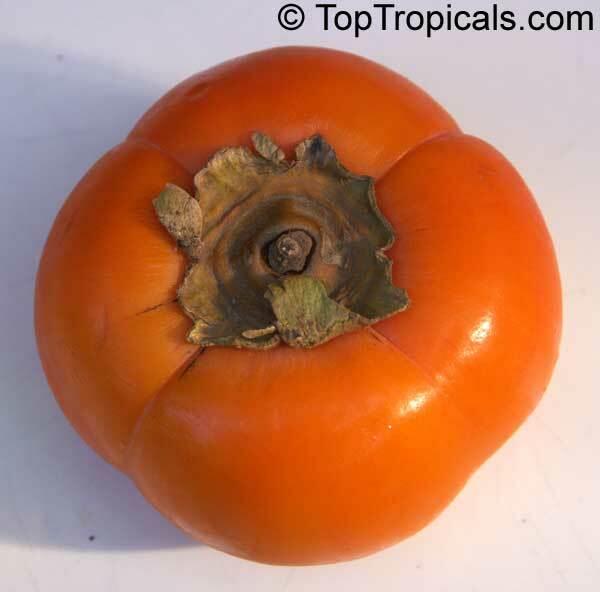 Oriental persimmon: Tanenashi or Tananashi, which means seedless (seed in Japanese=tane). 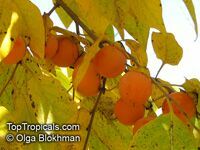 Oval, 4-5', skin - light yellow or orange, inside - dark orange-red, eaten soft (=astringent), very sweet, seedless, vigorous tree, prolific. Leading cultivar in SE USA, in CA tends to bear in alternate years. 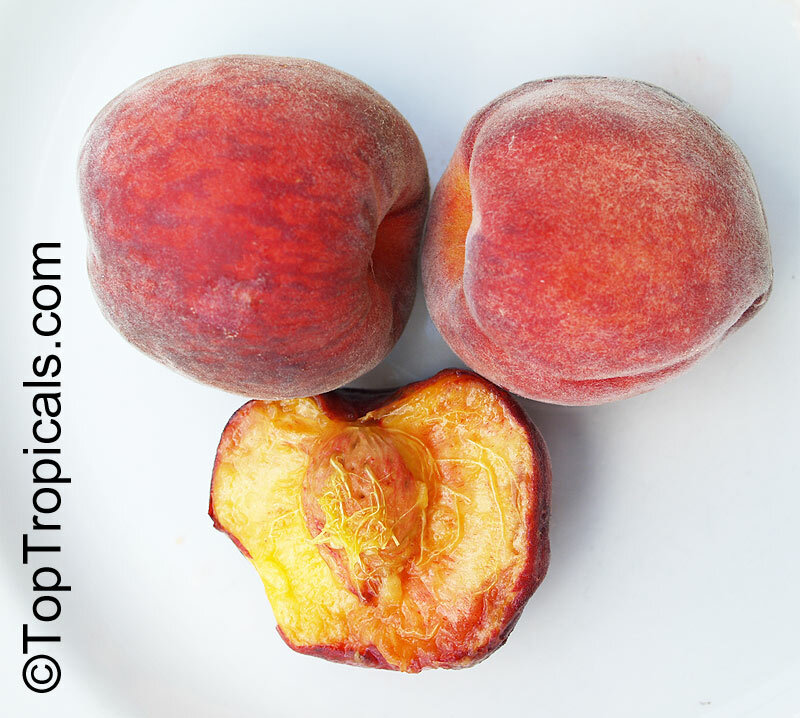 Astringent cultivars have water-soluble tannins in the flesh of the fruit at maturity (harvest) and do not normally lose their astringency until soft and ripe. 3738 Diospyros kaki - Persimmon var. Winterset, Low chill, Grafted ? Oriental persimmon: Winterset. 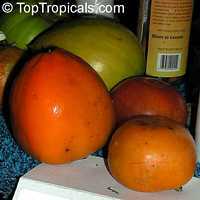 Astringent (=eaten ripe) , elongated fruit, yellow skin when ripe, seedless, super sweet, medium height, bear consistently, very cold hardy. Astringent cultivars have water-soluble tannins in the flesh of the fruit at maturity (harvest) and do not normally lose their astringency until soft, ripe, and very sweet. Very late harvest, November-December. 3500 Diospyros virginiana - Persimmon Triumph, Low chill, Grafted ? 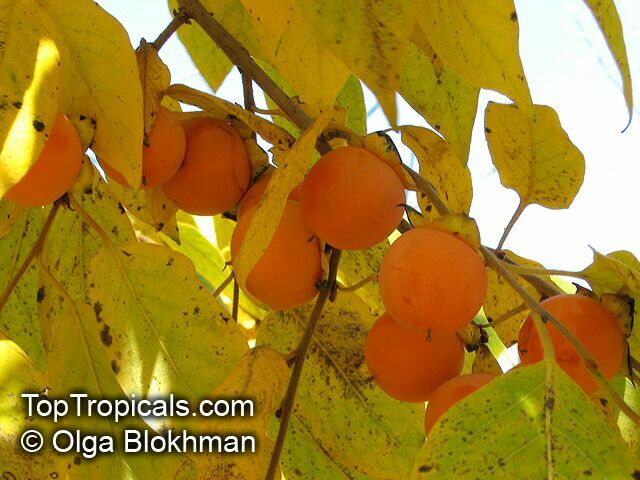 Native American Persimmon. Smaller, 2-3" fruit, astringent, doesn't need cold to bloom, eaten soft. 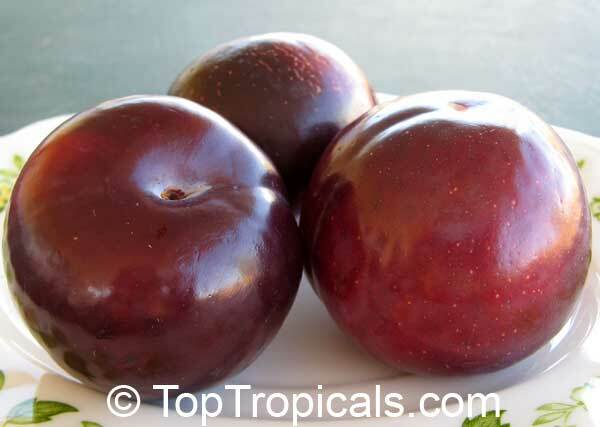 A plum-like berry that is green before ripening, turning orange to black when ripe, 3/4 to 2 inches in diameter. Cold hardy. 3751 Malus domestica - Anna Low Chill Apple, Low chill, Grafted ? "Anna" has red skin and is the most widely planted apple cultivar in Florida. The fruit resembles that of "Red Delicious" more than other low-chill apple cultivars. Originally from Israel, this large apple can be eaten green similar to "Granny Smith", or can be allowed to ripen to desired sweetness. 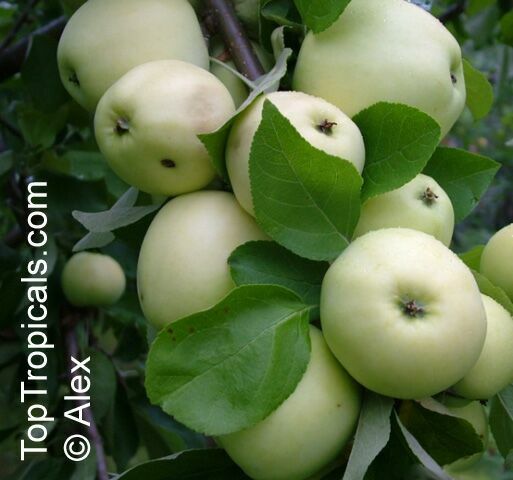 Low chill apples bear as far south as South Florida, and may be a unique addition to your yard. Attractive white apple blossoms will appear during Feb-March and give way to fruit (smaller than standard apples) in June. They remain a small tree, growing to about 15 feet. Best paired with another variety for good cross-pollination. 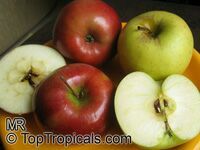 Sold in pair with "Dorsett Golden" variety - see item 4069 - Tropical Apple collection. Tall plants may be trimmed for shipping. Contact us for alternative shipping options. 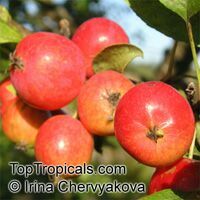 3750 Malus domestica - Dorsett Golden Low Chill Apple, Low chill, Grafted ? "Dorsett Golden" looks like "Golden Delicious" with golden skin and sometimes a red blush. 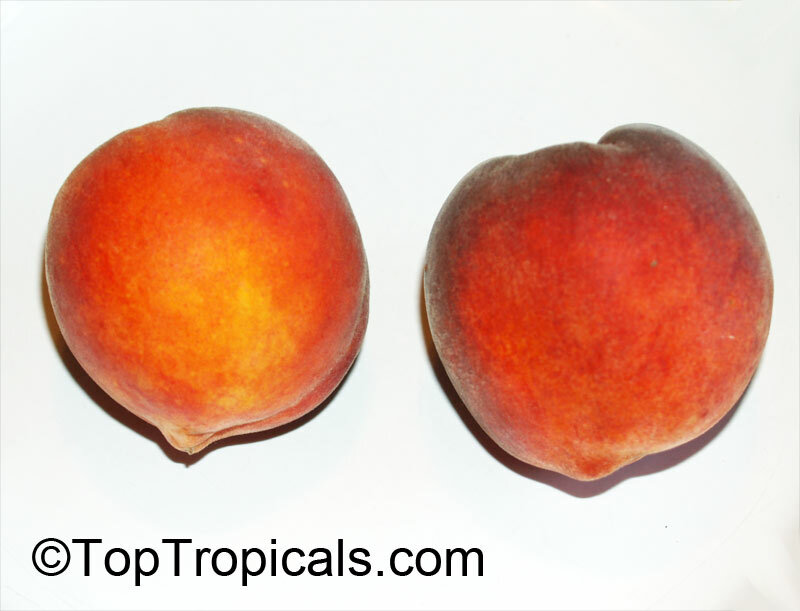 This cultivar was discovered in the Bahamas and is crisp and juicy with excellent flavor. Best paired with another variety for good cross-pollination. 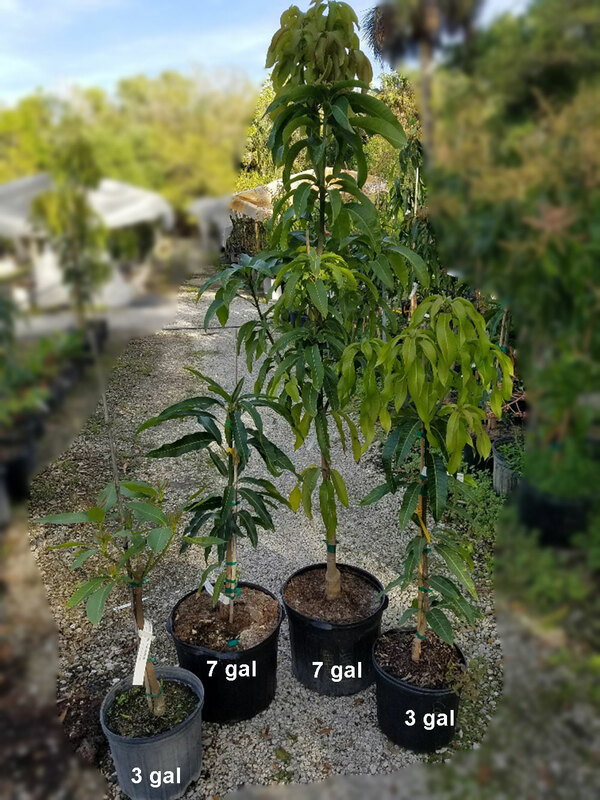 Tall plants and may be trimmed for shipping. Contact us for alternative shipping options. 4703 Prunus persica - Ceylon Peach, Low chill, Grafted ? Ceylon Peach - Smaller "native" peach with great flavor. Only needs 50 chill units to fruit. Fruiting well in the West Palm Beach area. 3701 Prunus persica - Peach FLORIDA BELLE, Low chill, Grafted ? Low-Chill Peach. Some plants with flowers. Meduim-sized fruit, purple outside, orange inside. Semi-cling and early, requiring only 150 chill hours. They grow it down in Phoenix, AZ, so you know it's taking the heat. Ripens in May. 3703 Prunus persica - Peach FLORIDA GLOW, Low chill, Grafted ? It has pink fruit outside fruit, white inside. Requires about 200 chill hours. 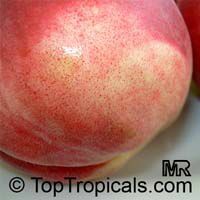 A sweet, low acid peach for Central Florida. Freestone. Ripens mid-May. Self-pollinating. 4343 Prunus persica - Peach FLORIDA GRANDE, Low chill, Grafted ? Requires about 100 chill hours. A sweet, low acid peach for South Florida, with large fruit. Ripens mid-May. Self-pollinating. 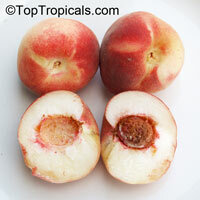 4089 Prunus persica - Peach FLORIDA PRINCE, Low chill, Grafted ? Low-Chill Peach. 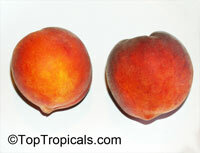 Medium to large size round fruit, red outside / yellow inside. It requires about 150 of chill hours. Perfect for lower Zone 9. Firm flesh, excellent flavor, ripens mid-May. Self-pollinating. 4088 Prunus persica - Peach TROPIC BEAUTY, Low chill, Grafted ? Low-Chill Peach. 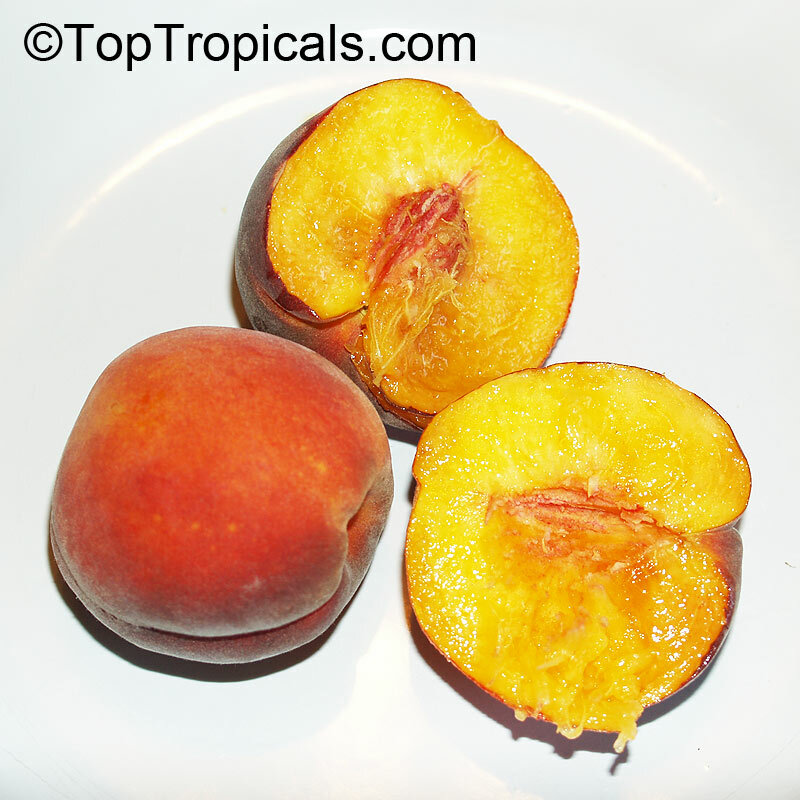 Medium-size fruit, purple outside, yellow-orange inside. It requires about 150 of chill hours. Perfect for Zone 9-10. Excellent flavor, ripens mid-May. Self-pollinating. 3758 Prunus persica - Peach TROPIC SNOW, Low chill, Grafted ? Low-Chill Peach. Medium-size fruit, white inside. It requires about 150 of chill hours. Perfect for Zone 9-10. 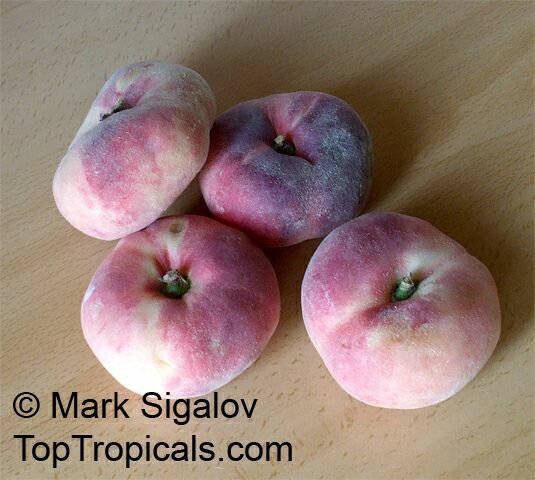 Excellent flavor, ripens mid-May. Self-pollinating. 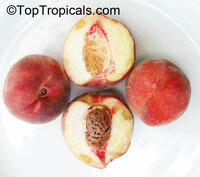 4102 Prunus persica - Peach UF BEAUTY, Low chill, Grafted ? Low-chill Peach. Needs only 200 chill hours. 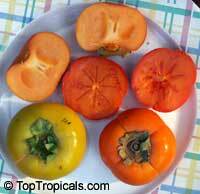 Red-yellow skin with very sweet non-melting yellow flesh. 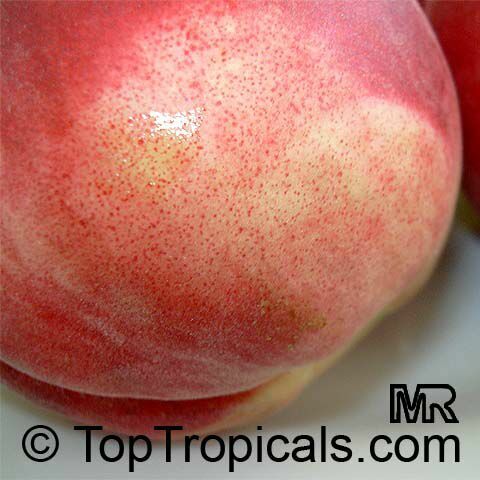 Ripens mid-May. Self-pollinating. 4090 Prunus persica - Peach UF SUN, Low chill, Grafted ? Very low-chill Peach. Needs only 100 chill-hours, so it can be grown in zone 10. 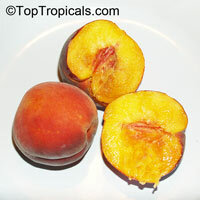 Red-yellow skin with very sweet yellow flesh. Ripens early-May. Self-pollinating. 4637 Prunus sp - Low Chill Plum Golf Beauty, Low chill, Grafted ? 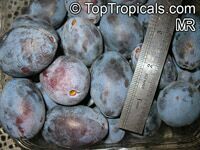 4101 Prunus sp - Low Chill Plum Golf Rose, Low chill, Grafted ? 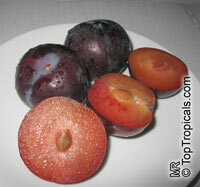 4998 Prunus sp - Low Chill Plum Hypoluxo, Low chill, Grafted ? Hypoluxo variety of low chill plum. Self Pollinator. Needs 200-250 chill hours. 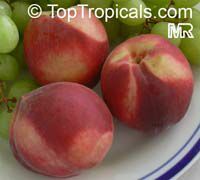 Small to medium round fruit with red/purple skin. Flesh is red, soft, very juicy and sweet. Ripens early. Tree is vigorous, upright. 4061 Prunus sp - Low Chill Plum Methley, Low chill, Grafted ? Methley variety of low chill plum. Needs 200-250 chill hours. Originated in South Africa. Small to medium round fruit with red/purple skin. Flesh is red, soft, very juicy and sweet. Ripens early. Tree is vigorous, upright.